With Japan in a devastated turmoil, many companies scrambled for survival. Hitachi Aviation, associated with Hino and Isuzu were forbidden to build airplanes and attempted to survive by producing non-war related products. Hitachi became Tokyo Gas-Electric Manufacturing Company and merged with Fuji Automobile and by 1952 was producing motorcycles and small two-stroke engines, called Gasuden. 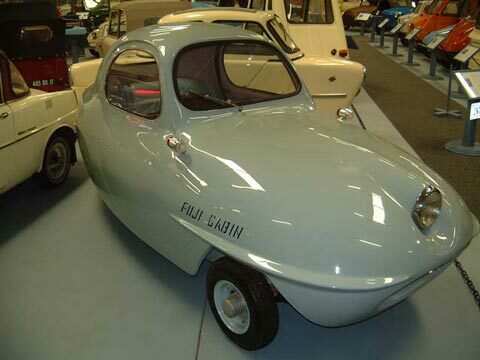 The Fuji Cabin was introduced at the Tokyo Motor Show in 1955, intended as a fully enclosed motor scooter. Its sleek aerodynamic monocoque body was constructed of polyester, a bold use of this material at the time. Very well engineered by Ryuichi Tomiya, a director of Suminoe Manufacturing which also produced the Flying Feather microcar and bodies for Nissan, the Fuji Cabin featured rubber suspension, staggered seating, a cooling duct down the centre of the car, and beetle-wing motor lids. The tiny, but well engineered Gasuden motor featured a reverse gear. Competition was stiff in the Japanese motorcycle market at this time and the price was somewhat steep. This, combined with poor marketing and inexpert handling of the FRP material, contributed to poor sales. This particular car turned up in a derelict condition in Pennsylvania, whereupon it changed hands several times before its acquisition and restoration for this collection. Another example (with two doors and detail differences) of this extremely rare exotic can be seen in Tokyo. Weight: 550 lb Electrics: 6 v 3 Wheels: 4.00 x 8"